Up until now, every single financial trading platform has required the involvement of brokers, which makes trading expensive. Spectre.ai is the first broker-less platform that allows clients to interact directly with the available financial markets. The platform offers access to various trading markets that include binary options and Contracts for Difference (CFD). This service offers something completely unique and new. In these days of technological advancements, you may be on board to use options like this for your trading. Though you might be wondering if Spectre.AI as reliable and useful as it makes itself out be. Owned and operated by Spectre Global Limited, they are located at Artemis House, 76 Fort Street, Grand Cayman, KY1-1111, Cayman Islands. To get in touch with support, traders can fill out a contact form on the website. 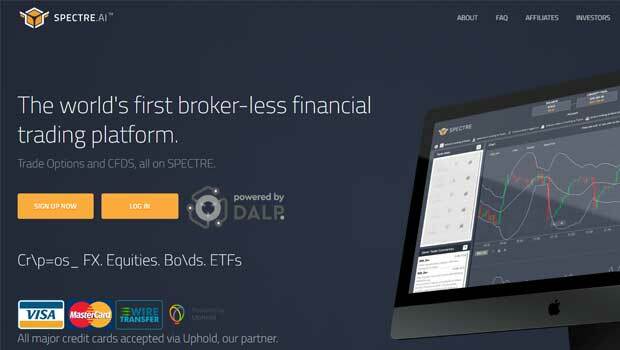 The Spectre.ai platform embraces crowd-sourced technology that enables it to match available traders against the available finances and other traders who have shown interest in the same contracts. There is a set of available contracts, whose security is ensured using auditors of the platform. Further, the platform embraces a block chain technology that offers connectivity to a global pool of traders and as such, saves your total transactional time. Moreover, the support of direct trading that occurs from your accounts is an added advantage offered by the platform and guarantees security of your funds. Efficiency is a guarantee of the platform, which also offers protection against brokers and fraudulent individuals. You will earn according to the volume of funds that you transact, and the platform only gains based on the volume technology of transactions that you make. Unlike most of the Forex trading platforms where verification is not guaranteed, Spectre.ai offers a transparent way of confirmation against a public digital ledger that authorizes the number of trade accounts and debits and credits made. Thus, you only gain access to the already verified trades in the market every day. Retail traders can enter the market and take up smart trading options in platform, where there is a guarantee of up to 200% payouts. Assets that can participate in this new technology include both the traditional and modern methods. Additionally, you can access wide ranges of holdings which boosts your payouts, and provides access to a wide range of trading types. Access to the live transactions and available liquidity is an added advantage of the platform as well, as you will enjoy long-term comfort even in cases where few traders are at your disposal. The platform provides a wide range of trading options, and you can choose to trade against others or the liquidity pool that is provided by the platform. The fact that neither the platform nor the available traders can access the liquidity pool makes the whole experience safe and secure. The platform uses block chain technology to access global records of the available trades and therefore ensures only audited clients can perform any transactions. The platform provides for the operations without having to deposit any amounts. Which ensures that Spectre.ai has no human interference, and improves overall reliability. The platform gains based on the different volumes of money that clients transact, and there are no charges on fund withdrawal transactions. Since currency volatility is among the various risks of distinct trading platforms, Spectre.ai is keen to curb the online exposure as their liquidity pool connects directly to your digital wallets. The platform offers for instant withdrawals and hence provision for efficiency as you access your funds. Additionally, if you look forward to performing ultra-fast trading, they are the perfect choice for your transactions as they can offer trades of up to five minutes with lucrative returns. Customer support and client satisfaction is a priority, as the platform ensures this as there is a 24/7 support for any issues that you may need to resolve. Transacting on the platform is efficient as you can even create a free demo account and start trading with various clients across the globe as you familiarize yourself with the platform. Regarding trustworthiness, reliability, and efficiency in the financial market, this new technology promises to be the go-to platform as you will be safe from any fraudulent activities on the website. With the incorporation of both block chain and crowd-source technologies, trading on the this platform is promoted as efficient and exposes clients to payouts of between 5% and 200%. Spectre.AI is packed with various features that make it seem very appealing to any trader. One of the biggest selling points for this service is the way it cuts out the middleman with its broker-less trading system. This kind of decentralized network approach to trading is what the financial industry is moving towards in recent years. Long time traders have long accepted this technological change. This certainly makes it easier for newer traders to get into the business. So, it only makes sense that Spectre.AI would want to take this approach for its infrastructure. The best part about having a decentralized network means a completely reliable and trustworthy trading environment. Spectre.AI uses the same technology that cryptocurrencies use to store their transaction data. This means that it’s next to impossible to manipulate or make fraudulent trades. You can rest easy knowing you won’t be victim to a scam or cyber-attack. To further improve their security, Spectre.AI also has a smart contacts system in place. This system allows you to make trades from a pool of verified users with an audited, secure, and verified system. You won’t have to deal with shady brokers and scams when all the verification work is done for you. Currently Spectre.AI is available globally except for certain countries like USA, Vanuatu Costa Rica, BVI, Caymans, Iran, Venezuela, United Kingdom, Syria, Somalia, North Korea and Yemen. The Spectre.AI interface is very intuitive and easy to use. The site hosts some of the best trading tools available. This one of the few binary traders where you can find excellent charting tools that can be used by beginners and veterans alike. You even get a helpful risk management system which allows you to set thresholds for alerting and mitigating your risks. This is an especially helpful tool for rookie traders that aren’t accustomed to the pace of high level trading. Spectre.AI doesn’t have exceptional customer support options. The only real way to reach them is via the contact form on their website or their support email. They do have a listed address but no headquarters in any major cities, which means your options will probably be limited to mail only, unless you’re thinking of planning a trip to the Cayman Islands. This may not be a big problem considering that Spectre.AI is based off a more tech savvy network. Most people may not even feel the need to have any physical offices for support. However, having a fax option or a phone number is typically the bare minimum that trading companies should keep. It’s entirely unfortunate that Spectre.AI doesn’t have a reliable contact for customers to reach out for potentially urgent matters. Making accounts with the company isn’t particularly hard and just about anyone can do it. It’s important to note that Spectre.AI deals with digital wallet currencies instead of conventional fiat currencies. This means that you’ll have to use cryptos like ETH to use the service for trading. There are different levels of accounts offered that provide different tiers of service. The company offers demo accounts as well if you just want to dip your feet and see how the service is before starting out fully. Spectre.AI gives you two basic accounts to start with; a regular account and a wallet account. To open a regular account, you need a minimum deposit of 0.10 ETH. To start trading, you have a minimum trade size $1. This account is suitable for most users and it offers all the necessary features and upgrades. According to the Spectre.AI website, this account will offer the highest possible payouts available. If you’re not interested in the decentralized network and just want to start trading immediately with a decent payout, this is the account for you. Opening a wallet account doesn’t need any minimum deposit at all. But you do need a minimum trade size of $50 initially to start trading. This option is more suitable for people that are used to blockchain based trading. This account offers all the additional features that you can’t get on your regular account or any other trading site. The decentralized network is key reason for choosing a wallet account as it offers great security and reliability options. The only real drawback here is that the payouts offered from the wallet account will be considerably less than what you can get from a regular account. The platform provides for protection against any fraudulent and malicious people on the internet. Additionally, clients save the money that they could have otherwise paid to the brokers. Moreover, the ability to trade directly against the financial market is an added advantage as the liquidity pool is not prone to human interference. Please comment, sharing your experiences below the article now. Hello, you didn’t say anything about their withdrawal system reliability. Please tell us. Hi Ndubuisi, I have had no issues. Very good review. I like to see more reviews from clients too. Looks good so far I’d say. I have used Spectre, and it’s idea is really revolutionary in the trading world. Your counterpart is not a broker but a totally neutral Liquidity Pool, which does not care if you win or loose. The company earns from the volume of trading, and not from your losses. Spectre is growing steadily, and is already distributing dividends weekly to their token holders (shareholders) – very rare. Take a look at their website Spectre.ai and learn more. I believe they are coming out with a very much enhanced user interface within 2 months. I have demo traded on it..seems okay..not as fluid as IQoptions but like the fact I can trade from my own cyrpto wallet. That is super cool..its a bit of a steep learning curve to figure out how to navigate the platform but when thats achieved its seemless to trade..overall its a welcome departure from broker-centric trading platforms..this has the potential to start a new wave of trading that a departure from what we currently have. Is anyone using this? I’d like to see what real clients think.